Body lotion is a daily staple for me. I literally slather it all over my body on a daily basis with some re-application to key areas throughout the day. I love feeling moisturized and hydrated. What do I not love?...the sticky or greasy residue that many lotions leave behind. It is one thing to apply a heavy lotion at night and deal with the residue while you are sleeping. But dealing with sticky/greasy residue during the day or when you are trying to get dressed quickly? No thank you! I have been a long term fan of Aveeno products and Aveeno moisturizers for many, many years. I trust Aveeno products and I know that they are both good for my skin and gentle for my sensitive skin. As an Aveeno Ambassador, it is exciting for me to try out new Aveeno products as soon as they are released! 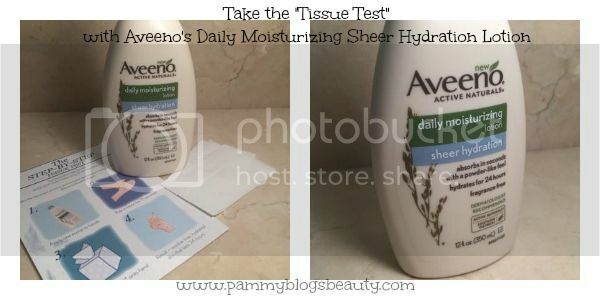 So, when they challenged me with the "Tissue Test" with their new Aveeno Daily Moisturizing Sheer Hydration Lotion, I was happy to step up to the plate and give it a try! Like the other moisturizers in Aveeno's Active Naturals Collection of products the new Aveeno Daily Moisturizing Sheer Hydration Lotion contains Aveeno's Active Naturals Colloidal Oatmeal (which works to nuture and replenish the skin barrier while preventing water loss to help maintain moisture all day long). This wonder ingredient contains five vital nutrients found in healthy skin: proteins, antioxidants, vitamins, polysaccharides, and lipids. It was so fun to participate in the tissue test! I challenge you to do so, too! It is simple. 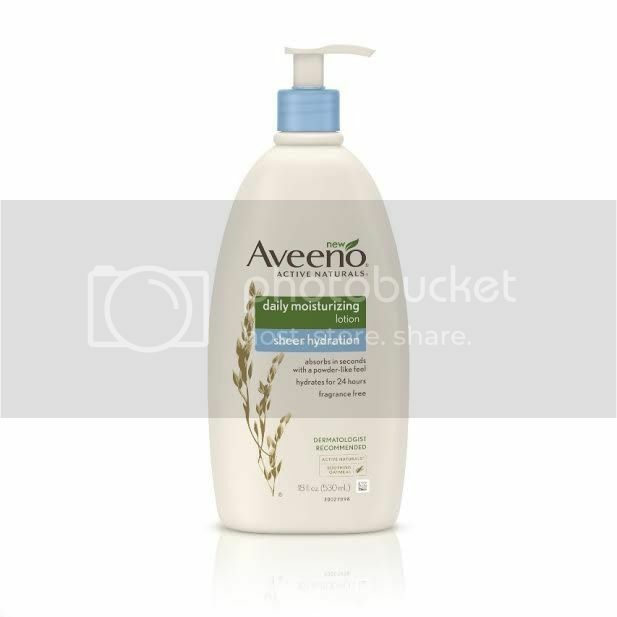 Just apply one pump of Aveeno's Daily Moisturizing Sheer Hydration Lotion to your hands. Then, rub it in for about 15 seconds. Next, lightly press your tissue onto hand. The results? You can see that your skin is residue-free. I am really impressed with this lotion! Not only did it pass my "tissue test" (that is right, no residue left on the tissue), but also I love how it hydrates my skin! My skin seems to just drink this lotion right in. Then after a few seconds, it feels like I have nothing on, yet my skin is hydrated and nourished! Instant softness and hydration without any sticky nor greasy residue. I am very impressed that this product packs such a moisturizing punch without those residue side effects. 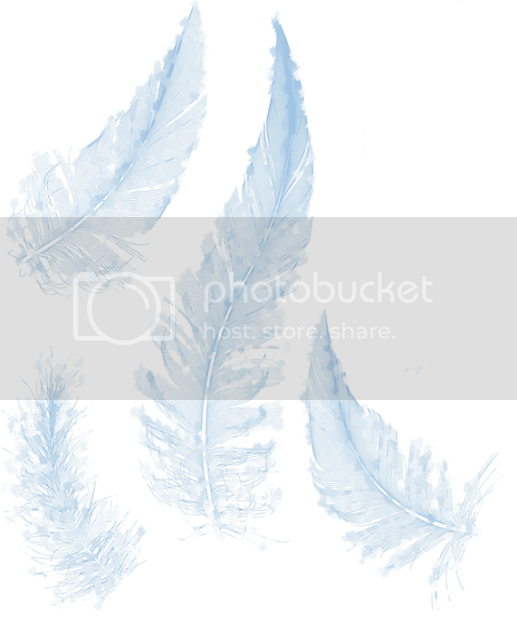 Just like Aveeno suggests, this product truly is feather-light! Also, as much as I do love playing around with fragranced products, I do appreciate a great non-scented product like this one. Not only does the lack of fragrance not compete with anything else you might be wearing, but also it decreases the odds of your skin being sensitive to the product. Aveeno's NEW Daily Moisturizing Sheer Hydration Lotion is an ultra-sheer lotion that absorbs in seconds leaving your skin feeling fresh and nourished! This lotion is fragrance-free and hydration results can last up to 24 hours. Available a mass merchandisers and drug stores for about $6.99 per bottle. Have you seen this new Aveeno Daily Moisturizing Sheer Hydration Lotion yet in your local drugstore? Be sure to check it out and do the "Tissue Test" yourself!